If you got the white screen after your last upgraded, you may want to read on. I will in this article explain how I go about debugging a site to find out what could cause the issue of a white screen. A white screen could be an issue with PHP errors and/or database errors, a blank screen with no information, commonly known in the WordPress community as the WordPress White Screen of Death (WSOD). The white screen issue can be caused by a Plugin that is no longer compatible after an upgrade. The first step that you should take is to set WP_DEBUG to true, and reload your page to see what additional information you get. 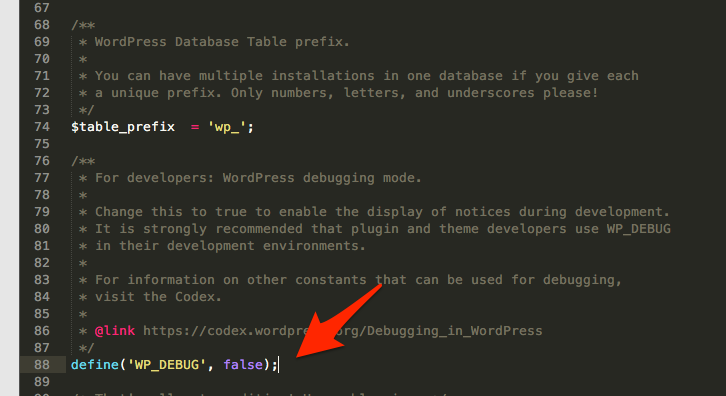 The WP_DEBUG entry you find in the wp-config.php file at the root of your WordPress install. If you got some message – read what they are and then google to see if you can find more details. Here is an example of a message that is displayed – you would probably see a text string, if you like me have Xdebug, you may see amore detailed message as below. If we take a look at this message, it shows that filter/action has been deprecated in the WPSEO 3.0, in my cases it was my theme that was using an old filter. This was an easy fix, as I disabled the plugin, got a fix for my theme and activated it all. If this is not the case that you can not figure out which plugin/theme causing an issue, you would want to start with checking your plugins. If you can access the Administration Screens try deactivating all of your Plugins and then reactivating them one by one.If you can not access the Administration Screen, you can deactivate all your plugins by logging in to your server via FTP. Find the folder wp-content/plugins and rename the Plugin folder plugins_old. Next you need to check your theme, using a different approach. To trouble shoot if the issue is your theme, log in to the Administration Screens and activate the default WordPress Theme. You should always keep one WordPress default theme, it is always useful for debugging. An issue with a theme is more likely after you have just activated a new Theme, or created a New Site in a WordPress Network. If you can not access the Administration Sccreens, log in to your server via FTP and rename the folder for the active theme, you find it here /wp-content/themes/ folder. If you have a different type of issue, a specific plugin is not working after an update, I suggest that you visit the WordPress Plugin site, check the details of the plugin Requires: 4.0 or higher, Compatible up to: 4.4.2 and when it was last updated. There could be a reasons hat you need to disable the plugin and wait for an update. Note: if you are updating the WP from 4.3 to 4.4, make sure that your plugin that you are using has been updated to be compatible with the new release. I often wait with an upgraded tills the plugins are compatible. With the upgraded to WP 4.3, the WP_Widget function call was deprecated, this caused an issue for me as I had two plugins with widgets that used the old WP_Widget. I had another scenario, in which I could not upgrade the WP tills plugins was compatible, I went ahead to update a few other plugins ahead of the WP upgrade. One of the plugins I upgraded caused an issue, so I had to rollback. There is a very handy plugin named WP Rollback, you should have it your list of plugins. Note: Running a multi-site – I keep a list of plugins that are approved, and there is an change management process in place on how to remove or add new plugins. If you are still experiencing problems and are looking in your error logs you can check out the PHP errors below for more information.